For most of the past century, there have been Kiwanis Clubs serving sections of Inner Southeast Portland. Today, Inner Southeast is served by the Ross Island Kiwanis Club, which draws members from throughout our part of the city, and meets at 7 a.m. on Friday mornings at the International House of Pancakes on S.E. 82nd Avenue of Roses. But there's an even older club in the Rose City – Portland Kiwanis. It's a hundred years old this year. Kiwanis is one of a trio of prominent "service clubs" that are well-known throughout the world – the other two being Rotary International and Lions Clubs International. For the past century, members of the Portland Kiwanis Club have devoted time to numerous events for the betterment of their community and the children of the world. Everything from organizing Christmas parties and food drives for underprivileged children, to selling Rose Festival buttons and peanuts at fund raisers. Now a variety of celebratory events are being planned to mark this important anniversary. In honor of the Centennial celebration, Connie Shipley, President of Portland club, gives us a glimpse into the club's background. Her book, "Celebrating a Century of Service: A brief History of the Kiwanis Club of Portland", will soon be available. She tells us that the roots of Kiwanis can be traced back to Detroit, Michigan, in 1914 – when two businessmen, Allen S. Browne and Joseph G. Prance, felt it was time to build a networking organization for young men. Those they recruited were looking for an organization that was more service-oriented, to improve their neighborhoods and help people who needed an extra hand. Life in 1914 was a daily struggle; the working class had to endure long hours and short wages. While raising a family of six or more children, there was little if any extra money to enjoy any of the simplest pleasures – like taking a trip to the beach, or spending a weekend in the countryside. Buying groceries, providing new clothes for the family, and household drudgery and the demands of a job, left nothing put pennies for any additional amenities. Many men couldn't even afford to have the daily newspaper delivered to the doorstep. It was only the wealthy, it seemed, who had additional free time and enough money to enjoy whatever pleasures they desired. Mr. Browne and Mr. Prance decided to make a difference, to the betterment of their community. Their vision was to establish a group of men who believed in projects to help improve the standards of the community – or work jointly with other, similar, clubs to accomplish this goal. They weren't just satisfied with accomplishing their ideals locally, their plan was an organization of volunteers that would dedicate their money and participate physically to improving the world. Quite an undertaking for two gentlemen sitting around at the local coffee shop wondering what to do in their spare time! In 1915, Browne and Prance persuaded enough volunteers to form a new organization, initially called the "Supreme Lodge Benevolent Order Brothers". 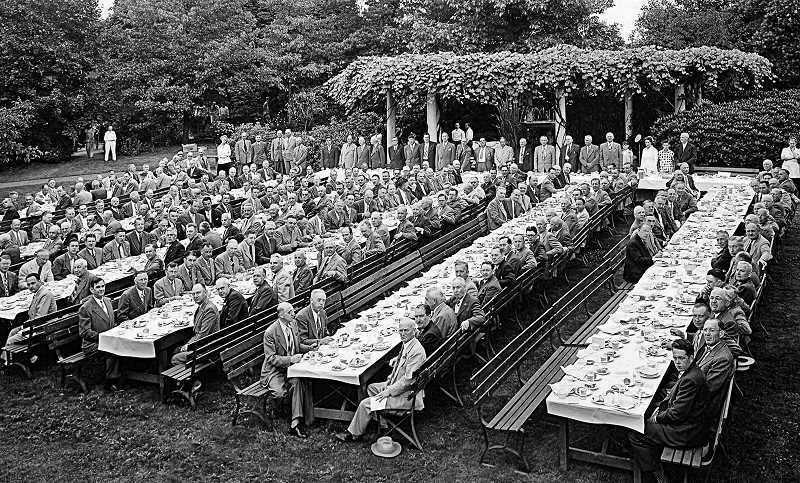 According to club records, the Detroit club within the following six months signed up an additional 200 members. By the following year the cumbersome name was changed to the simpler Detroit Kiwanis Club. The name Kiwanis is derived from a Native American expression, "Nunc Kee-wanis", which means "We Trade." Club members determined that they indeed wanted the organization to be focused on service, and purchased the club from Mr. Browne at the Birmingham convention in 1919, for $17,500. As interest in the new Kiwanis organization and its message spread across the country, people in other states sought to establish their own organization. Recruiters were sent across the nation to help with guidelines, and to establish additional branches of the Kiwanis Club. Each club was able to decide for itself what projects they wanted to pursue, and what programs their members were interested in supporting. In the Northwest, meetings were announced and gatherings posted for the curious to attend. Speeches and demonstrations were given by the delegates sent from the Midwest, and recruiters stopped in most big cities – in the Northwest, from Portland north to Tacoma and Seattle, and Vancouver, B.C. The turnout at the meeting in Portland on a cold December morning in 1918 exceeded expectations, and sixty interested volunteers were signed up as new members at the initial meeting. Plans went forward to open the local club, but the Portland organization still lacked the 100 members then required for certification. One of the obstacles blocking the formation of a new club was the shortage of men – particularly healthy men. Portland was then in the midst of a public health crisis: In October of the same year, a solder passing through Portland from Fort Lewis in Washington State came down with one of the worst and most contagious strains of influenza known. A number of "Spanish Influenza" cases began showing up in the local hospital, and soon the community was in a panic about contacting this often-fatal flu. The Oregon Board of Health had previously ordered that all schools, churches, and public meeting places be closed immediately to reduce contagion risk. State and local officials warned people not to congregate in large groups – in movie theaters and in social gatherings. This warning kept most of the local would-be Kiwanians from attending the meetings and joining the club. While it isn't recorded how the Portland Club managed, in this climate of fear, to collect the required 100 members, they apparently did so – and on December 28th, 1918, the International Kiwanis headquarters certified the forming Portland Club as the new Kiwanis Club in this district. And, on January 15th, 1919, Secretary O. Sam Cummings arrived by train from Detroit to present the official charter to the Portland Kiwanis Club. But, with the threat of the Spanish Flu still on Portlanders' minds, only a handful of the new club's members chose to attend the dedication. Nonetheless, the Kiwanis Club of Portland was officially declared a charter club, and began pursuing community service. The club's first projects here included a fundraiser that accrued $7,000 (a very substantial sum for that time) for the American Women's Hospital Fund, and a drive to send humanitarian supplies to the Armenian Relief cause overseas. Thousands of Armenians were forming a new republic near the border of Russia and Turkey, and many of the fleeing refugees were faced with domestic and foreign problems caused by the territorial dispute between those two nations. The Portland Kiwanis Club hoped to support for the Armenian cause. Club administrators proposed an even bolder move, when they sent a delegate to the National Kiwanis Convention held in Birmingham, Alabama. Frank Creasey was dispatched with instructions to secure the following year's Convention for Portland! The businessmen of Portland, along with the Kiwanians of Portland and the Portland City Council, were overjoyed when Creasey returned to announce that Portland had been chosen for the 1920 National Kiwanis Convention. Today's President of the Portland Kiwanis Club, Connie Shipley, commented, "This was a tremendous feat for one representative of a fledgling club that had only just received its charter five months previously." How Creasey managed this remarkable accomplishment was revealed upon his return to Portland: "Every morning Mr. Creasey had American Beauty Roses presented to every lady visitor to the convention, bearing the compliments of the Portland Club, with the reminder that Portland was a candidate for the next convention." Other civic groups across the nation, and many locally as well, were skeptical that the comparatively new and diminutive Portland club could manage a successful national convention, but – supported by the businessmen of the Rose City – some 1,500 delegates and their families happily attended the two-week meeting, and the local club's members made a favorable impression on all attendees. Providing activities like visits to Oaks Park, free shuttle tours along the Columbia River Highway, and showcasing some of Portland's finest chefs, hotels, and the picturesque landscapes around Mt. Hood with our many splendid falls and tall trees, the Kiwanis Club of Portland proved to be the perfect host for that year's convention. Unlike social groups, Kiwanis dues were never spent on building lodges for meetings and special events. Club gatherings were held in assembly rooms, auditoriums, and public halls around downtown Portland. And for the past sixty years, Portland Kiwanis meetings have been held at the Benson Hotel. The Multnomah Hotel (now the Embassy Suites) and the Portland Hotel were previous club meeting places. The Mayfair Room was the main meeting room for decades. The Chandelier Room – now called the Crystal Room – with its unique Austrian crystal chandeliers and cathedral windows was a previous meeting place at the Benson, also. Fred Kiser, one of Oregon's most famous landscape and commercial photographers and commercial photographers, became a prominent Portland Kiwanis Club member in May of 1921. Many of his hand-colored photos (some of the first of their kind) featuring Oregon's Crater Lake, and Glacier National Park in Montana, were distributed worldwide. Club members volunteered to help Fred in his pursuit to preserve the scenic spots of Oregon through photographs. At one time Kiser's "Scenic Photo Studio" was situated on the corner of S.E. Milwaukie and Bush Streets in the Brooklyn neighborhood. One of Kiser's many accomplishments was having been selected as the official photographer at the Lewis and Clark Exposition back in 1905, held in North Portland. He went on to promote the opening of the Columbia Gorge Highway and Multnomah Falls with his scenic photographs and postcards, sold across the United States. Meantime, when auto camps were becoming popular during the 1920's, and the Portland Kiwanis Club was there to assist vacationers and "autoists". Help was needed, since autos were becoming more affordable for the average worker, largely due to the mass production techniques of Henry Ford, and most of these vehicles did double duty as campers and RV's. On long trips requiring overnight stays, drivers and their passengers – if they didn't have friends to stay with – had to sleep outdoors. Motels and rest stops had not yet been created, and travelers had to sleep in farmers' haystacks, or in open fields! Auto camps were established for motorists who usually slept in their own car, yet wanted the use of a clean bathroom and shower in the morning. Auto camps included outdoor grills, firewood, and drinking water – and tents for rent. North Portland had one of the first such campsites, and that was thanks to the Portland Kiwanis Club. Most of the camp's supplies and cabins were either built by the members or paid for from club funds. The Kiwanis Club was so helpful that a road was named for the club – Kiwanis Drive. 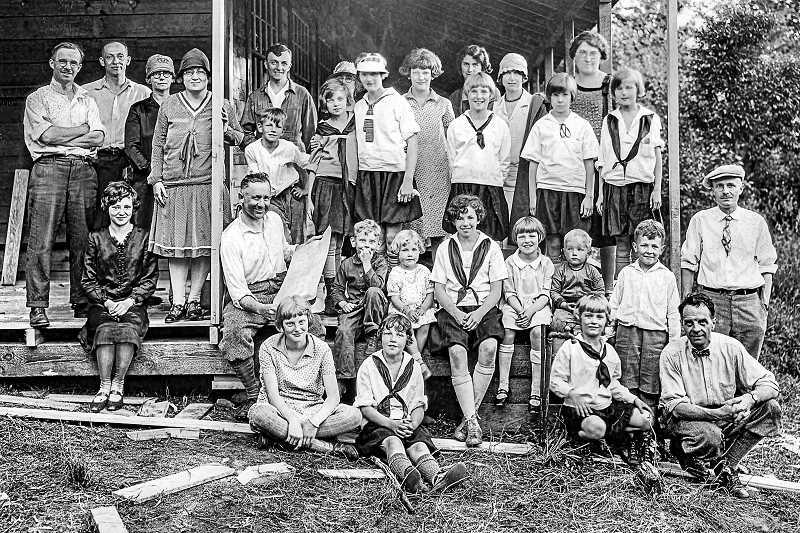 One of the Kiwanis major accomplishments in 1924 was the support of Camp Namanu, a Campfire Girls retreat, set away in the wilds along the Sandy River. The owner of the eighty-acre parcel, Samuel Cobb, eventually donated a part of his land to the girls; but during its first years, the young ladies had to camp out in the open meadows. To the rescue came the men of the Portland Kiwanis Club, bringing hand-held saws and hammers (since electricity wasn't available until the 1930's). They brought with them lumber and nails to help build a lodge and cabins for the Campfire Girls. Every summer from then on, volunteers were involved in repairing, updating, and adding needed fixtures like benches and bunk beds for the camp – and even sponsoring girls who could not afford the fees to go to camp. The Club supported Camp Namanu for over 35 years. Meanwhile, along with playing an active part in many phases of the Rose Festival – such as building and decorating floats, and chauffeuring the Rose Festival Princesses around town – they answered the call by the newly-formed Montavilla Kiwanis Club, which was instrumental in another outdoor summer camp – one for children and adults with disabilities. This was the "Mt. Hood Kiwanis Camp" near Rhododendron, which was established as a safe environment for people with hearing impairments, Down Syndrome, Autism, and other health issues. The children who were enrolled at this summer camp were able to enjoy their very first fishing experiences, dancing with new-found friends, going horseback riding, and trying their luck at boating and swimming – all, in a positive atmosphere. Partnering with the U.S Forest Service, all Kiwanis Clubs in the region supported campers with sponsorships. Members built lodges and cabins, and annually visited the camp to clear trails and repaired the buildings. The Kiwanis Clubs have been members of the Camp Foundation Board over the years. For many years during the 1930's and 1940's, the Portland Kiwanis Club sponsored an annual Christmas party at the Paramount Theater for underprivileged and handicapped youngsters. These parties featured movies, vaudeville acts, and of course, Christmas stockings filled with goodies for over 1,500 children – plus a visit from Santa himself. If it weren't for the Portland Kiwanis Club, few of these young people would have been been able to celebrate and remember the Holidays. In 1987 the Kiwanis followed Rotary and other service organizations in accepting women into membership, equally able to vote and be elected as officers. Today, Kiwanis Clubs support humanitarian and civic projects, local and international. 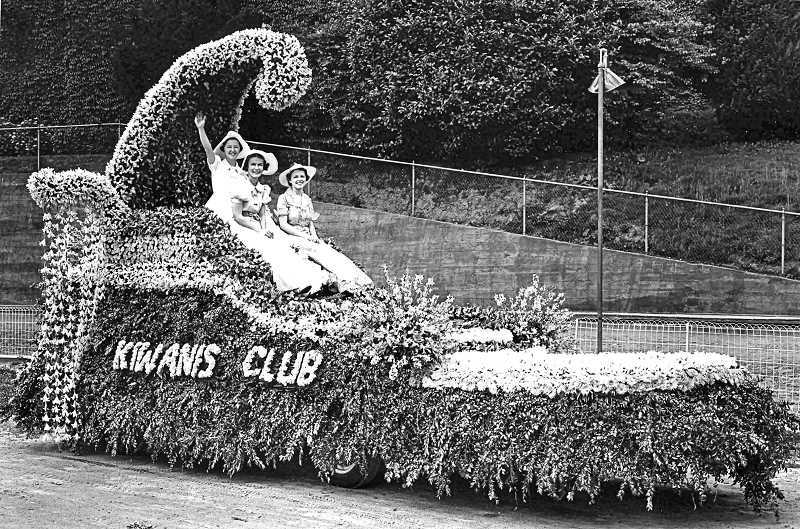 As for the Kiwanis Club of Portland's one hundredth anniversary, some of the events this year will include participation in the Starlight Parade on this June 1st, entertaining the Rose Festival Court at breakfast on June 5th, and an inter-club picnic at the Hillsboro Hops baseball game on July 21st. Contributions and fundraisers for the Doernbecher Children's Hospital and Mt. Hood Kiwanis Camp are ongoing throughout the year, and a planned Christmas party at the end of the year will round out the Centennial activities. Special thanks to Connie Shipley, this year's President of the Portland Kiwanis, for her time and the historical information about the local Kiwanis Club she provided for this article. As Kiwanis describes itself today: "Kiwanis is a global organization of volunteers dedicated to changing the world, one child and one community at a time."